By now, you've undoubtedly heard that the US Congress is considering various legislation ostensibly designed to help protect the owners of copyrighted material from the threat of online theft and piracy. While we at the Lab do recognize that theft of copyrighted material can be a problem, and we do support the right of creators of works to have some control over the distribution of those works, we feel that the legislation being considered (known as the Stop Online Piracy Act and the Protect Intellectual Property Act, or SOPA and PIPA) are the wrong way to address the problem. These bills would permit (or possibly mandate) that websites accused of inappropriately posting or linking to copyrighted material be "blocked", possibly by preventing DNS systems from properly directing traffic to the correct IP address and by forcing search engines to stop returning links to the accused offenders. These powers could be invoked by holders of copyright material. One concern is that the legislation fails to provide sufficient due process, allowing holders of material to attempt to silence websites without having to provide proof of wrongdoing. In this way, individuals or organizations might attempt to suppress the publication of legitimate work (such as parody) or other "fair use" products by invoking a preemptive silencing of a website. As an example of how it might affect the Lab, hypothetically, the Coca-Cola company might not approve of a review in which we claim that Coca-Cola tastes a bit like lemon Pledge. They could claim that this site had violated copyright by using terms such as Coca-Cola, and seek to have weirdsodareview.com blocked for an indefinite period while the issue is resolved. It is possible to imagine this being used as a tool to suppress criticism or dissent, rather than combat theft. This could occur despite the fact that it is perfectly legal to use copyrighted terms such as Coca-Cola in criticism, review, or parody. In addition, the proposed mechanisms would be ineffective at deterring real piracy, as they are relatively easy to circumvent. Because of that, the bills are unlikely to actually deter theft, while making it easier to suppress legitimate use of copyrighted material. Because SOPA and PIPA would make wielding such power too easy, but fail to actually accomplish their stated goals, we at the Lab do not support the legislation, and urge Congress to revise the bills to provide stronger protections for individuals and companies who are not actually violating intellectual property law. Sometimes Weirdness is thrust upon you. The Kibbitzer-in-Chief and I were on our way to see Eddie Izzard at the Hollywood Bowl. If you've never been to the Hollywood Bowl, you're missing a treat. It's an enormous outdoor amphitheater, with seats ranging from private tables down near the stage (season tickets for these are desirable enough that people pass them on as part of their estates) to rows of benches up on the hill, far enough back that it is amusing to observe the delay between what you see and what you hear. Guess which seats we always buy? It's really no burden to have the cheap seats, though, because they're just as much fun. Part of the Hollywood Bowl experience is bringing a picnic dinner, which you eat at your seats before and during the performance. People bring anything from McDonalds to gourmet five-course meals on china and crystal. And at least in the cheap seats, it's not uncommon to lean over the folks in front and say "ooo, that looks good!" and end up sampling each others' food. It's a really fun, social atmosphere. Well, we were coming up from San Diego, so we ran into traffic and ended up getting to the Park & Ride lot about fifteen minutes before the last bus to the Bowl. And, of course, we had no picnic dinner. What an unbearable arrangement! Fortunately, I am a technophile, and asked my iPod to find us the nearest grocery store. There was an Albertson's half a mile away. Putting the pedal to the metal in my 1994 Ford Aspire*, we pulled into the parking lot...but there was no Albertson's. There was, instead, something called "Freshia". Hmmm. Must be some sort of Whole Foods-like place. We eat lots of that kind of thing. No problem. After entering Freshia, our first hint that there would be a minor difficulty was that we couldn't actually read anything. All of the labels were--as far as I could tell--in Korean. As we wandered the isles, acutely aware that the few minutes we had left were running down, we realized that we were faced with a scenario in which we would have to buy packages of unknown substances and hope that they were tasty (that they were, in fact, food and not auto parts). The Kibbitzer, being a much better cook than I, took on the task of identifying edibles. In such a situation, I felt that it was my duty to find some capacity in which I could help resolve our emergency--some way in which I could provide help, solve problems, and get us to the bus with a delicious dinner. "I've never had Korean Weird soda before!" I thought, and headed for the aisle which looked as though it had liquids. I ended up paralyzed with indecision, having realized that I was not sure whether the brightly colored bottles with engaging (but, to me, illegible) labels were some sort of fantastically Weird soda or kids' shampoo, when the Kibbitzer found me. At a glance, she could see that not only I had been distracted from my mission, I was incompetent. I hung my head in shame. She grabbed a couple of bottles, said "These might be interesting," and led me gently to the prepackaged food section. Have I mentioned how good this woman is to me? We ended up grabbing something which looked like pasta in sauce labeled "Platycodon" (which, as it turns out, is a fibrous vegetable with a rather strong scent), something which looked for all the world like Klingon gaghwith garlic labeled "Fern Bracken", and something which we chose to believe was chicken. Nobody wanted to share our picnic dinner***, but we had a wonderful time and a fascinating culinary adventure. And, as it turns out, had soda Weirdness thrust upon us. 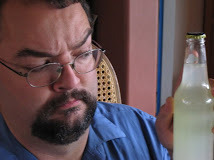 The Kibbitzer had grabbed two bottles: a carbonated rice wine and a drinkable vinegar. I'm not up for wine tonight, so let's try the vinegar. The setting is quaint and picturesque, reminiscent of midwestern Americana. Note the watering can, wood siding, and homely brick. And the Korean drinkable vinegar, of course. The label does bear a helpful English translation underneath the (rather dramatic) Korean writing. The picture suggests that it contains honey, a supposition which is borne out by a quick look at the ingredients list. Apparently, it contains honey black vinegar, fructose, apple juice, glucose, dextrose, and...er...silicon resin. Acids, sugars, and semiconductors...that's a Weird beverage for sure. Where and when: purchased sometime in 2011 at Freshia, which might have been in Torrance, CA. Color: Brown and translucent, about the color of the malt vinegar you find at fried fish places. Pours as if it were more viscous than wanter, seems a bit thick. Scent: The main scent is sweet, but with a lot of earthiness and a strong vinegar. Can something smell like body odor, but in a good way? It's massively, overwhelmingly sweet, almost like sipping straight honey. Thicker than it looks, too, like a thin glue. How much sugar is *in* this stuff? Ah, that explains it. This has 17.86 grams of sugar per fluid ounce. Compare that to Coke Classic, which has 3.25 grams of sugar per fluid ounce. This stuff is roughly 5 and a half times more concentrated sugar than Coke. By my calculation, assuming the sugar is glucose, this is about a 3.3M sugar solution, which is pretty impressive in a beverage. The massive, brain-melting sweetness is nicely offset by a remarkable spike of appleish vinegar through the frontal lobe. The two are actually in excellent balance, and the resultant flavor is quite pleasant--just completely overwhelming. I'd be afraid to put this in a hummingbird feeder, lest they all develop instant diabetes. Nazgul: *sips, shrugs, nods* "Mmmm. I don't know why you don't like sweet stuff." This from the boy who would happily eat straight cake frosting. I love sweet stuff. This is to conventional sweet stuff as Mighty Cthulhu is to a plate of fried calamari. K-i-C: "Smells like apple cider vinegar with honey." *sips* "Lots and lots and lots of honey. But it's actually very nice. You need that sweet to balance out the acidity." So we have a quandary. The taste is quite pleasant, complex, and very well balanced, just about ten gazillion times too strong. I wonder if some of the untranslated Korean text on the label reads "Warning: For the love of God and insulin, do not drink this stuff undiluted." Quaff rating: 3.5. The taste is lovely, and it's certainly interesting. Cough rating: 1.5. I might have done a spit-take, except given the viscosity, it would have come out more like a loogie than a fine spray. * Doing so can--given a good tailwind--push you above the speed limit**. "He should try Irn Bru!" "We need to get this guy some Irn Bru." "It is only by the intervention of Irn Bru that you can be saved." Since I began this blog, I have heard of many legendary sodas. Rumor has reached my ears of beverages for the quaffing in Japan in flavors too bizarre to mention. Some of my readers have spoken of elusive and unspeakable drinks whose names and flavors will not suffer their names to be spoken. Among these, one has been mentioned more than once; I have been told to seek out Irn Bru. The very name festers with numinous wonderment. Is it an acronym? A fragment of an incantation in Hyperborean, to be chanted in certain disquieting stone circles on nameless hilltops? Does it imply that it is a beverage brewed in funerary ash containers? Is it the preferred beverage of Ernie, companion to the longsuffering Bert? Oddly, among those who have recommended it, its characteristics are not entirely consistent. There are those who say it originates in Scotland; others place it elsewhere in the British Isles, while there are whispers which say it owns hypothetical and rumored Leng or Lomar as its home.This made it hard for me to find. And yet it came to pass that I found myself (along with the Lab staff) on Massachusetts Avenue in Lawrence, Kansas. I was born and raised in Topeka, and the Lab was making a New Year's journey to my ancestral homelands. This was not a soda pilgrimage, but a Quaffmaster must be ever-vigilant; the six-foot cardboard Dalek in the storefront window suggested the possibility of Weirdness inside. While the rest of the Lab staff was distracted by the chocolates and DVDs of "Lark Rise to Candleford", I was drawn to the refrigerated cabinets near the back, in which there was indeed British Weirdness to be found. Poking through the offerings, I selected a few likely candidates (which I will review soon), but then I spotted it: Irn Bru. Right there in front of me. There it stands. Proud. Unafraid. Orange. It's at times like this that I hear voices in my head. Some hear angels, or the voices of beloved relatives, guiding them to wise actions and noble needs. I alternate between Ming the Merciless and the Wicked Witch of the West. "SEIZE IT, YOU FOOL!" shrieked the voice in my mind. So, naturally, I did. I seized it with vigor. The bottle of Irn Bru was carefully carried back to Topeka , lovingly packed into a suitcase nestled in warm woolen socks, armored above and below with nice thick role-playing-game rulebooks, and borne westward on Amtrak to the Lab. And now I can, with trembling anticipation and unholy glee, open it and experience the eldritch bubbliness of the far-famed, stong-greaved Irn Bru. Where and when: Purchased at Brits (929 Massachusetts Ave., Lawrence, KS) in January 2012. Color: Oddly orange, with an ever-so-slight pink tinge. Sort of a dark melon color. Scent:Strong bubblegum, weak berry, very weak citrus. I need to figure out what it is which gives some of these sodas that powerful cotton-candy/bubblegum flavor. K-i-C: "Smells like Bazooka." I'm assuming she means the bubblegum; if not, there are aspects to my dear wife which I had not suspected. Taste:The bubblegum is there, and strong, but not utterly overwhelming. There is a fairly potent orange-ish taste under it--but not an orange soda flavor like you find in Crush or Fanta. It's...as if there was just a bit of peel included. Just that hint of bitter. K-i-C: *shudder, pause...* "Tastes like really pointy bubblegum...very sharply carbonated, that hurt...I feel like I should be chewing." The tangy-bitter citrus aftertaste is still persisting, inobtrusively. It *is* very sharply carbonated. "I call upon the great god Dy-Zan, and for his greater glory...and our mutual pleasure...I destroy it utterly." Could there be any greater ritual incantation for such an occasion? I think not. Quaff rating: 2.5. Pleasant but uninteresting. Cough rating: 1.0. That aftertaste is STILL there. UPDATE: Just after writing this review, Nazgul came out from his sleeping compartment. He said he felt a bit hungry. After consuming a glass of milk, one and a half slices of vegetarian baloney, a banana, a handful of almonds, a piece of colby jack cheese, and some tossed green salad, we had a little talk about proper nutrition during waking hours (apparently, sunlight makes him allergic to anything other than yogurt and Cheez-Its). In the course of this discussion, we discovered the hidden truth behind Irn Bru's name. To my astonishment, this truth also explains why we found it in Kansas. This is the only soda I've had which supplies an appreciable amount (5%/8 oz.) of the RDA for iron. It contains ferric ammonium citrate. Hence the name, a corruption of "Iron Brew", I suppose (although I don't remember Ironbeer having the same qualities). As to it being found in Kansas: if you imagine a Kansan saying "Iron Brew", you can imagine it coming out sounding more like "Aaaahhhhrrrrn Breeeuuuuwww". A literal transcription might render it "Ir'n Bru". Nazgul: "Do I need to brush my teeth again?" This one isn't a review (although I will have some holiday-themed beverages coming soon). I wanted to make this a warm-hearted holiday post. This holiday season (whichever winter-solstice-adjacent holiday you may observe, if any) has been a season for family. We at the Lab have made a journey to my ancestral home in Topeka, Kansas to visit my ancestors (amongst whom I include the illustrious Rotalmomska and Rotalpopska). I have a brother as well, who does not yet have an alias in the Lab, but whom the Kibbitzer thinks should be "Rotalbroska". We'll see. 2) The realization that--according to Google--the phrase "eldritch hootenanny" has never been published on the entire World Wide Web. May you and yours have a marvelous holiday eldritch hootenanny! Sincerely, the Quaffmaster, Kibbitzer-in-Chief, Nazgul, and Olorin.